Jenna Schulz didn't have an epiphany when it came to ending her basketball career. It was rather a gradual process, during which the Liverpool High junior came to realize that as much as she loved basketball, it was holding her back on the track. So, when it came time to trade in her flats for hi-tops following cross country season last fall, Schulz did something she hadn't done since second grade - she said no to basketball. While she misses playing basketball, the results she had running track this winter, coupled her expectations for the spring have erased any doubts she may have had about her choice. "I played basketball for the fun of it," Schulz, 16, said. "I wasn't super competitive. I wasn't one of the stars and I knew I was going to have a better career running. I just knew that I was going to run in college and not be a professional basketball player or close to it. "It [running over the winter] has helped a lot. I was always frustrated with my outdoor season. I'd come back after three months of not running and not performing the way I wanted to. Indoor helped me bring my times down." Schulz's indoor resume from the recently completed winter season is dotted with first- and second-place finishes. 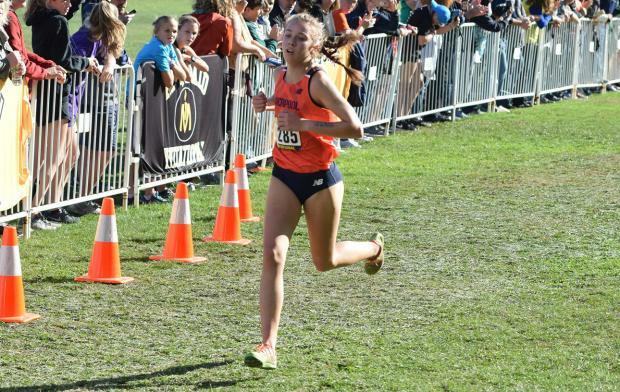 She also put up several personal record times, including in the 3,000-meter run, an event in which she placed 10th at the New Balance Indoor Nationals earlier this month [PR of 9:46.27]. 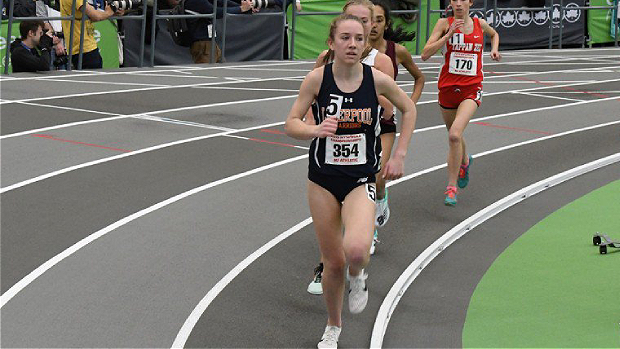 She shaved more than three seconds off her previous best, which she achieved the week before when she finished eighth at the New York State Championships. 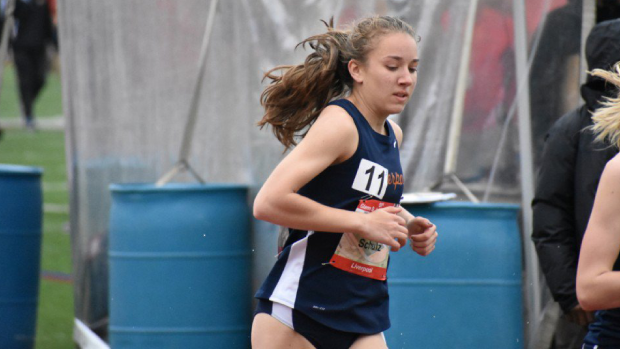 Now she has her sights set on breaking 9:40 in the spring and being competitive with the top runners in the state, not only in the 3K but in every event she enters. She didn't make the State Championships as a freshman or sophomore in the outdoor season but believes that the work she put in this winter will help put her there this year. She finished 2nd at State Quals last spring in the 3,000m, but lacked the State Standard. "I'm expecting a big spring," Schulz said. "I am excited and I kind of want to redeem myself after my first two years outdoor. The indoor season exceeded my expectations. I know I can go into the outdoor season now with that training under my belt. Mentally, it will be easier for me to get there [States] now that I have the training in. But I have to keep working. "I want to do more in the 1,500 and mile. I definitely want to run a few 800s to get my time down. I'll probably mix things up between the mile, the 3K and the 1,500." Liverpool indoor coach Jeff Abbott had an inkling as to what Schulz was going to do over the winter as the cross country season drew to a close. He watched her brother, Stephen [now running at Syracuse] also give up basketball to concentrate on track during his junior season. "It kind of happened the same way with her brother," Abbott said. "He made the switch and I had heard rumblings [about Jenna] and I had kind of known after working with her outdoor [last spring]. I was happy about it but I can't say I was surprised. "Going from cross country to indoor, where she started the [indoor] season was pretty much where she ended outdoor last year. I feel like she's going to have the strength through the outdoor season this year and it will be exciting to see what she does. It's a huge advantage." 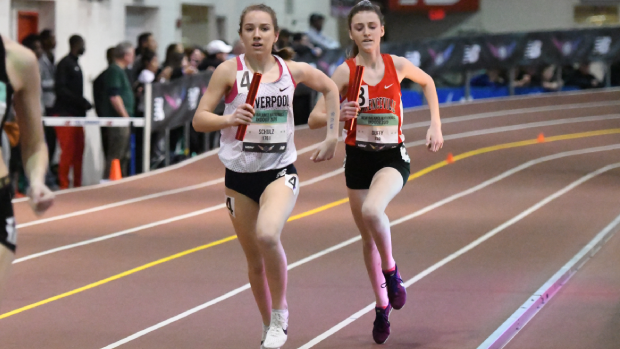 While Schulz has a newfound advantage for the spring, she also knows that North Rockland's Katelyn Tuohy will be looming for the bigger meets such as states and nationals in these events. Tuohy is one of the premier runners, if not the premier runner, in the country so in almost every race it is her and then a battle for second. Schulz has made peace with that notion. "She [Tuohy] is going to be there so I'm used to it," Schulz said. "Coming in second [to her] is a good spot. The rest of the pack is all competitive minus her and it definitely mixes the races up a bit. I've changed because of her. I think when she goes out fast, some people try to go out with her." Schulz said she and many of her competitors have gotten better since they realized that Tuohy is going to be 'out there" and that she doesn't have to go out faster than she is used to just to keep up. "It's hard when you can't run the race you want and you try to run based on other people," Schulz said. "I've tried that and it doesn't work so I'm adjusting my race plan." Schulz has given a great deal of thought to her race plan. She also takes some time in a quiet moment to reflect on what she's accomplished but prefers to focus more on what she still wants to do. "I like to keep thinking forward," Schulz said. "You can never be satisfied. You always want more. It helps keep me driven."